Archbishop Bartholomew of Constantinople wants to broker an ecclesiastical peace among the Orthodox. He is concerned that a national Ukrainian Orthodox Church will bask in God's sunshine without the paternal guidance of the Moscow Patriarchate. There is a fundamental fact that the Archbishop must recognize. A free nation is entitled to its own spiritually sovereign church. In a congratulatory letter to Viktor Yushchenko he said that the Mother Church of Christ is "pleased to convey to Your Excellency our satisfaction on your election to the Presidency of Ukraine." Good for the Archbishop that he approves. Ukrainians are also "satisfied" having been oppressed, brutalized and culturally marginalized for centuries by foreign religious and political authorities. He further wrote that "We are painfully aware and saddened by the present crises of Orthodoxy in Ukraine, the faith of the forefathers of the Ukrainian people. As we have expressed repeatedly our concerns about the unacceptable disunity within Orthodoxy in Ukraine, we have also repeatedly expressed our readiness to assist to ameliorate this painful situation." The Archbishop added that it "seems that it is most propitious as this junction to initiate the process of healing this disunity, and the Great Church of Christ, the Ecumenical Patriarchate, is ready to render any assistance in this endeavor." To a cross they nailed their cruelty. In vain, they spat to sully your purity! You rose in the souls of men and women in truth and faith ..."
His Holiness Patriarch Filaret of the Ukrainian Orthodox Church Kyiv Patriarchate, leader of 30 million faithful worldwide, is doing that which the Greek prelate supports. Patriarch Filaret is a Godly activist who tirelessly tries to gather the whole flock away from the looming northern shadow that embodies the Russification of Ukrainian culture, language and spirituality. His Holiness should be public applauded for furthering the spiritual dignity and honor of his country. The Archbishop's concern of unity is easy to obtain. All it takes is a sincere respect for Ukraine's sovereignty - not just on political matters, but on spiritual ones as well. Historically, Ukraine never wanted to be spirituality subordinate to Moscow. Military conquest made it an inevitability. Today a free people have the ability to choose not only their political destiny, but their spiritual fate as well. Ukraine has spoken loudly on both matters. Patriarch Alexis II of Moscow must be reminded, with much Christian patience, that all are equal before God. His discomfort with an emerging Ukrainian spirituality suggests that Russian Orthodoxy is more valued before the Creator. This is incorrect. God loves and accepts all children equally. Recently, the Moscow prelate sanctioned use of armed guards at Ukrainian sites still under his administrative authority. He showed the spiritual insecurity to call Orthodox branches, which refuse submission to Moscow, schismatics. Not surprisingly, he also expressed contempt for Byzantine Catholics. The Russian prelate said, "Unfortunately, schismatics and Uniates were among those who actively supported the opposition candidate, who has now been elected president." It's time the Russian prelate face reality. Ukrainian faithful need not ask anyone's permission on how best to walk with God. Ultimately, whether an ethnic outsider considers a branch of the Ukrainian Orthodox Church, especially the Kyiv Patriarchate of 30 million faithful or our Byzantine Catholic brothers and sisters, "canonical" is irrelevant. Ukrainians answer to God and conscience, not foreign religious and political leaders. Archbishop Bartholomew wrote to President-elect Yushchenko that "We are constantly praying to Almighty God to bless the long-suffering nation of Ukraine with peace, justice, prosperity and freedom for all its citizens." I agree. Actions, however, speak louder than words. The continued spiritual Russification of a free people is unacceptable. Archbishop Bartholomew, having called the faithful to unite, must educate non-Ukrainian Orthodox leaders to respect Ukraine's spiritual sovereignty, cultural integrity and emerging national consciousness. Bishop Paul Peter Jesep is Chancellor of the Archeparchy and Vicar General of Public Affairs and Government Relations for the Ukrainian Autocephalous Orthodox Church-Sobornopravna (UAOC-S). In the past, His Grace a lawyer and political scientist by training, served on the staff of U.S. Senator Susan Collins (R-ME). He has studied at Bangor Theological Seminary (bts.edu), the third oldest such school in the United States. 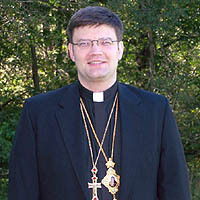 Bishop Jesep may be reached at VladykaPaulPeter(at)aol.com. The views expressed here are strictly personal.